Welcome to the RiggStories Store! This is the place to find apparel, goodies, and stuff to show your love of all things RiggStories! All of the items here link to our store at TeeSpring, so feel free to visit us there too! Click the image for access to all the choices available in the RiggStories Store. This fashionable, but simplistic, statement is the perfect compliment to your "My favorite audio drama podcasts" wardrobe! Now you can wear the official headwear of United States Reconstruction Bunker Groom Lake 51 civilians, military, science, and maintenance personnel. This sturdy EMBROIDERED hat is made from 80% acrylic and 20% wool, and has an adjustable snap back to fit almost any head size. Commemorate the fateful last voyage of Earth Return Vehicle 2 with this mission patch mug emblazoned with the names of astronauts Morse, Dunn, and Hickson; and Enterprise One, the orbital station home base. Available in Enterprise One Blue, White, or Gray. The book that started it all! The first book in the Heart of Bronze series follows the story of "Alice," a woman from our time and reality who suddenly finds herself lost in a Steampunk fantasy world filled with intrigue and danger. With the help of characters she meets along the way, such as a dashing Confederate officer, a witch, and a hapless manservant, she searches for clues to find her way back home. 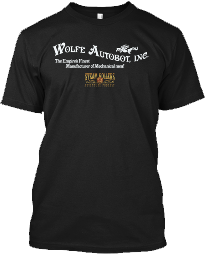 Show your love for your favorite actual-play Steampunk Comedy Adventure Podcast with this awesome "Concert Tee!" Our giant logo blazes on the front, and a list of our popular "concert stops" (aka. fictional locations in the show) on the back! Support the Empire's finest manufacturer of mechanical men! Yes, the company that brought you cogmans and Copperhearts, like RBY2187, Nigel Edmund Wesley, and more! It is what it says: "Steam Rollers Actual Play Steampunk Comedy Adventure Roleplaying Game Podcast In Your Ears!" Now, if someone asks you what the SRAP is, just point to your chest! This design is also available as a tee shirt! Show your love by wearing OUR heart on your sleeve, laptop, computer case, window, door, lunchbox, or nuclear waste container. Enjoy your morning coffee as you look over the array of monitors depicting radiation levels outside the bunker, or sip as you chat with IRIS. Available in Green, Gray, Navy, Black, or Maroon. The follow-up novel to the highly-rated Clockwork Looking Glass, Pandora follows the story of the popular witch character from the first book, picking up right where she left off. What happened to Pandora at the end? What happens next? Clockwork Pandora introduces exciting new characters, like a scrapping retired Property, pirate-hunting soldiers, and a vile airship pirate captain! There are crossover elements to the Steam Rollers Adventure Podcast in the pages of Pandora! Keep up with the adventure! Join the rebellion against...whatever it is this mysterious group is rebelling against! Show your support for the reunification of the United States with this awesome SRAP tee. Holds your favorite cocoa, tea, coffee, "secret booze," or some Mint & Tyke Super Special Crushed Bean Pick-Me-Up Nector Juice! Sip to your contentment as you listen to the Steam Rollers Adventure Podcast.